Professor David Little leads the Society and Technology Interface Team and the Aquaculture Systems Theme. Specialising in aquatic resource development and capacity building with an Asian focus. Strong track record in research and outreach with commercial and development partners on aquatic food security challenges. Over thirty years of experience in interdisciplinary research and education, significant proportion based in the Region generating around £ 10 million income. Published over 100 academic papers and reviews; (h index 27; ~2500 citations). Supervised over 100 postgraduate student research projects, of which more than 20 have been PhD. Key role as coordinator and partner of interdisciplinary and intercultural research for development. Professor Trevor Telfer leads the Environmental Management Team and specialises in Environmental interactions of aquaculture, with 30 years experience in marine environmental assessment. Research is mainly focused in the EU, west Africa and east Asia, looking at dynamic and spatial models for aquaculture capacity, sustainability of aquatic resources, ecotoxicology of aquaculture chemicals and environmental mitigation using new aquatic technologies. He has been principal supervisor to 15 PhD students. Currently, he is the Coordinator for the EU Horizon 2020 large scale collaborative project TAPAS (Tools for Assessment of Aquaculture Sustainability), and is the Stirling PI for the EU H2020 project Climefish (Co-creating a decision support framework to ensure sustainable fish production in Europe under climate change). Prof Telfer is also Director of Teaching and Learning for the Institute of Aquaculture and is actively involved in both Undergraduate and Postgraduate programmes. 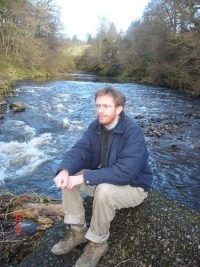 Dr Michael Leaver is a Senior Lecturer with research interests in ecotoxicology and particularly the area of biomarker development for environmental monitoring and in aquaculture nutrition related to fish lipid metabolism. He uses a variety of molecular and biochemical techniques including the application of “omic” technologies. He teaches at Undergraduate and postgraduate level in the areas of ecotoxicology, omics and systems biology, biotechnology and molecular taxonomy. Dr Francis Murray has 25 years’ experience in aquaculture related fields encompassing industry, academic research, rural development and consultancy, giving him a broad inter-disciplinary perspective on the aquaculture sector and a detailed understanding of the interaction of market, technology, management, and the physical, social and economic environment. He has commercial experience in salmon production and a research background on integrated small-holder aquaculture systems in Asia and Africa, working with CARE International and the World Fish Centre. He was a co-coordinator of a highly inter-disciplinary EU-FP7 large-scale collaborative research-project ‘Sustaining Ethical Aquaculture Trade’ (SEAT). This project assessed the sustainability of major export seafood commodity groups farmed in Asia acknowledging values and perspectives of stakeholders along entire value chains. He is currently specialising in global value chain analysis and market-based seafood governance (eco-labelling and certification). He coordinates two new large-scale collaborations; ‘PRIMEFISH’ (EU Horizon 2020) researching competitiveness of European seafood sectors and ‘IMAQulate’ (BBSRC/DFID) evaluating costs and benefits of prophylactic health products on smallholder farmers In Asia and Africa. He also leads/ coordinates several smaller international projects researching novel approaches to reducing aquacultures dependency on marine feed ingredients (Ghana, Kenya, Tanzania), aquaculture carrying capacity and zonal management strategies (Indonesia and Vietnam), farmer adaptation strategies to saline intrusion in delta areas (Bangladesh), and sustainable coastal aquaculture livelihood diversification strategies (Sierra Leone). Dr Bruce McAdam is an ecologist with an interest in numerical methods for analysing unusual data sources, ranging from long term historic data to archival tag data. He has previously in Iceland, working mainly on the population structure of Icelandic population of Atlantic cod, Gadus morhua, and now acts as a modeller in the Sustainable Aquaculture Research Group in the Institute of Aquaculture. Bruce has turned his attention towards the ecology of aquatic food species, after originally gaining a PhD in programming language theory at the Institute of Informatics at the University of Edinburgh. John Bostock is the MSc Aquaculture Programmes Director at the Institute of Aquaculture and manager of its consultancy and project management arm "Stirling Aquaculture". John started his career in freshwater biology and fisheries before studying marine biology and zoology and then aquaculture and fisheries management. He worked on a fish farm project in Tanzania before joining the Institute of Aquaculture to support training projects in Bangladesh. Since then he has worked on over 120 consultancy projects in UK, Europe, Middle East, Africa, Asia, North America and the Caribbean for government agencies, non-government organisations, financial institutions, large and small private companies. His teaching spans aquaculture system design, economics, marketing, financial appraisal and business management. He has a particular interest in recycle systems, and the implementation of ICT within aquaculture. He is active in EU collaboration projects including EURASTIP, BlueEdu, Primefish and AQUAEXCEL2020. The latter as workpackage leader for Transnational Access to European aquaculture research infrastructures. Previous roles included coordinator of AQUA-TNET and the Aquaculture Innovation Network, and a workpackage leader in the ASEM Aquaculture Platform. Through these he has a strong interest in Knowledge Exchange and innovation processes and fostering these through the use of Internet and digital media. Will Leschen has over 30 years working in the commercial, government & research sectors of aquaculture in the UK & internationally, primarily in SS Africa & South Asia. He is presently managing the Scottish govt funded Aquaculture Enterprise Malawi (AEM) project, and also running the former EC FP7 funded SARNISSA African Aquaculture Network with over 2700 benefitting members. Another EC FP7 project Proteinsect is trialling insect larval feeds with commercial tilapia producers in Ghana & Thailand, & Atlantic salmon in Scotland. Will also worked on another EC FP project PAPUSSA - Peri-urban Aquaculture potential & sustainability across 4 SE Asian cities. He previously specialised in aquatic animal health at CEFAS Weymouth UK, & spent 4 years living in Ghana working on small scale rural aquaculture development. Dr Lynne Falconer is a Postdoctoral Research Fellow with an interest in aquaculture and the environment. She specialises in the development and use of (primarily GIS-based) models for aquaculture site selection and carrying capacity assessment, freshwater and marine spatial planning, and the ecosystem approach to aquaculture. Lynne has worked on research projects in Asia, Europe and Latin America covering freshwater, marine and coastal ecosystems. She is currently part of two large scale collaborative EU H2020 research projects: TAPAS (Tools for Assessment and Planning of Aquaculture Sustainability) and ClimeFish (Co-creating a decision support framework to ensure sustainable fish production in Europe under climate change). Dr Mahmoud Eltholth is a Postdoctoral Researcher on the BBSRC funded project “Evaluating Costs and Benefits of Prophylactic Health Products and Novel Alternatives on Smallholder Aquaculture Farmers in Asia and Africa (IMAQulate)” in India, Kenya and Bangladesh and on the Newton funded project “Behavioural Prophylaxis in Tilapia” in Egypt. Mahmoud’s main area of interest is Epidemiology, Public Health, Aquaculture, Value Chain Analysis and Health Economics. He has been a co-investigator in many national and international multidisciplinary projects in collaboration with the Royal Veterinary College, University of London, World Fish Centre and the International Livestock Research Institue. Along his career, Mahmoud has gained experience in qualitative and quantitative research methods. Mahmoud contributes to the preparation and delivery of Epidemiology and Veterinary Public Health lectures for undergraduate and postgraduate courses. He has also been supervising several research projects and MSc Veterinary Epidemiology dissertations. Steven McKillop is a Research Assistant on the EU Erasmus+ Sector Skills Alliance Project "BlueEDU" which is examining the vocational training needs and current provision within the European cage-based aquaculture industry. Steve discovered his own vocation in aquaculture after serving in the British Army and working in the construction industry. He worked for three years running a salmon hatchery before moving into the education sector as a fish farm instructor/lecturer at Barony College in Scotland. Whilst there he accumulated both vocational and academic qualifications including a research MSc in Zoology and PG Certificate in Teaching in Further Education from Aberdeen University. Robyn Shilland is a Research Administrator with the IMAQulate project, assessing the cost-benefit of prophylactic health products (PHPs) in India, Bangladesh and Kenya. Robyn has an MSc in Marine Environmental Management from the University of York, researching the interaction between environmental conditions and scallop populations, and has an interest in sustainable management of marine resources. Alongside her work at Stirling, Robyn works in social media marketing and runs an NGO funding community-led mangrove conservation in East Africa through the sale of carbon credits.